Filed to: ore monogatari! !Filed to: ore monogatari!! As an overused Kurt Vonnegut quote goes, “Everything was beautiful and nothing hurt.” This is something that can be said, with none of the irony of the original context, about the spring 2015 romantic comedy Ore Monogatari!! (My Love Story!!). This is a wildly funny and sweet show that’s going to leave big shoes to fill, literally and figuratively, in the genre for seasons to come. The story is about high school first-year Takeo Gouda, a lumbering giant of a guy with an equally big heart. Takeo is admired by his male peers for his strength, athletic prowess, and generally being a bro to all, but intimidates girls before they even try to get to know him. It doesn’t help that his best friend, Makoto Sunakawa, is the quintessential bishonen. Takeo’s luck finally starts to change when he saves the adorable and kind Rinko Yamato from a train groper. What follows is Takeo’s titular love story, and it’s one of the most well done and refreshing romances in anime. Takeo is not your usual romance protagonist. Yes, his looks are a far cry from the delicate heroes we’re used to seeing, but what makes him special is much more than skin-deep. Whereas many romance leads are marked by cynicism, detachment, and the subsequent journey to overcome those things, Takeo stands out for his kindness and never-ending willingness to help others. He isn’t a knight in shining armor. He just helps anyone and everyone who comes to his attention! Instead of falling in love in spite of himself, Takeo finds romance because of his compassion and willingness to stand up for those in need. Although Takeo is the protagonist, point-of-view character, and comedic center of the show, Yamato and Suna, who round out the trio of main characters, are no slouches either. Yamato’s sweetness and demure personality belie a surprisingly take-charge attitude towards relationships. She initiates much of the romance with Takeo, and it’s established that she’s head over heels for both emotionally and physically. There was some concern going into Ore Monogatari!! that the central relationship would be played out as a beautiful, “ideal” girl like Yamato liking Takeo despite his unconventional appearance. Although the show does emphasize looking inside and appreciating people for who they are, Yamato is not quite a Yamato Nadeshiko. She’s a huge dork. She may be cute and tiny, but she shares Takeo’s kindness, excitability, and innocent enthusiasm for life. She is also passionate and diligent when it comes to her main hobby, baking. Suna is truly a sleeper hit of a character. He might be the most artfully developed of the main cast, and that’s fitting, since Ore Monogatari!! 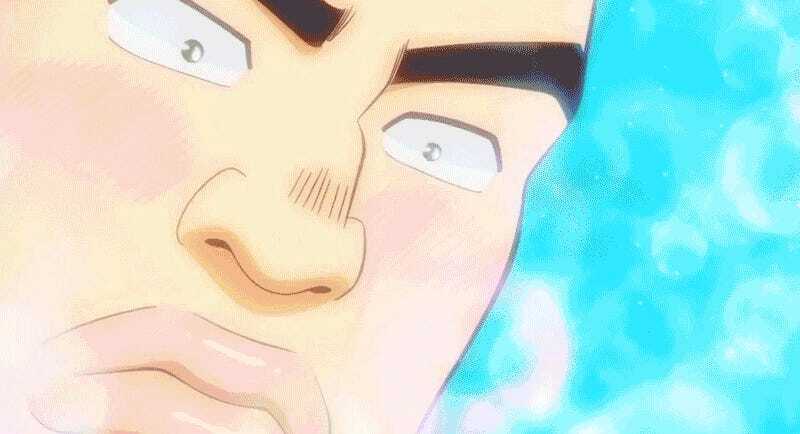 is equally a love story about Takeo and Suna’s friendship as it is about Takeo and Yamato. Suna’s initial impression as a character is of someone defined by their aloof nature. He is cool-headed, but the story slowly reveals him to be an emotionally mature, observant, and caring person. He is guarded around others in part because he so astute about who truly has his friends’ best interests in mind. Although he’s always there to help Takeo, it’s clear that Suna needs his friend just as much. The contrast between Takeo and Suna shows that true friendship can manifest itself in different ways. When I first started Ore Monogatari! !, I wasn’t sure how the characters and story would remain fresh episode after episode. Takeo is a great guy and helps someone or overreacts to something, Yamato is sweet, and Suna is chill about it all. Would everything be able to keep its momentum for 24 episodes? Would the dichotomy between Takeo’s appearance and personality become an overplayed joke? I’m happy to report that any concerns I had (and that I’ve heard from people wondering if they should watch) were put to rest. 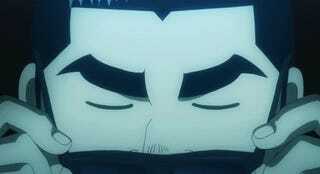 Takeo is not portrayed as unattractive. His appearance being surprising and not traditionally handsome are remarked upon, but throughout the course of the show he gets plenty of romantic attention for both his personality and his looks. He is, of course, mostly blind to his affect on certain women around him. Ore Monogatari!! is not some progressive masterpiece, but it can be surprisingly subversive. In a reversal of the usual roles, Yamato is more sexually frustrated and Takeo is too pure-hearted for his own good. In a shoujo romance with no fanservice, it is different to see a teenage girl expressing physical desire for her boyfriend and being more forthright about moving the relationship forward. When romantic comedy is done well, it’s a genre I can get into. The problem with a huge portion of the offerings in it, though, is that they employ a lot of contrived drama to move the plot along. Have you ever watched a romance and nearly yelled at your screen because they characters just needed to talk to each other to solve a conflict? Are you tired of romantic comedies with no actual romantic payoff? Then Ore Monogatari!! is the show for you. This is not a will-they-or-won’t-they romance. The plot focuses on the established relationships between the main characters. Conflicts will happen in any relationship, but Ore Monogatari!! tends to focus on the simple, yet common questions that arise in the early stages of a romance instead of dire, cosmic drama. Some people may find this less exciting than other rom-com fare, but I appreciated having a show that dealt with the small things. The one time the show does have a subplot that involves a manufactured breakdown in communication (the Disney World episode), it works because it exaggerates the cliche while also using the opportunity to explore a supporting character’s emotional development. Enough about romance - what about the comedy? 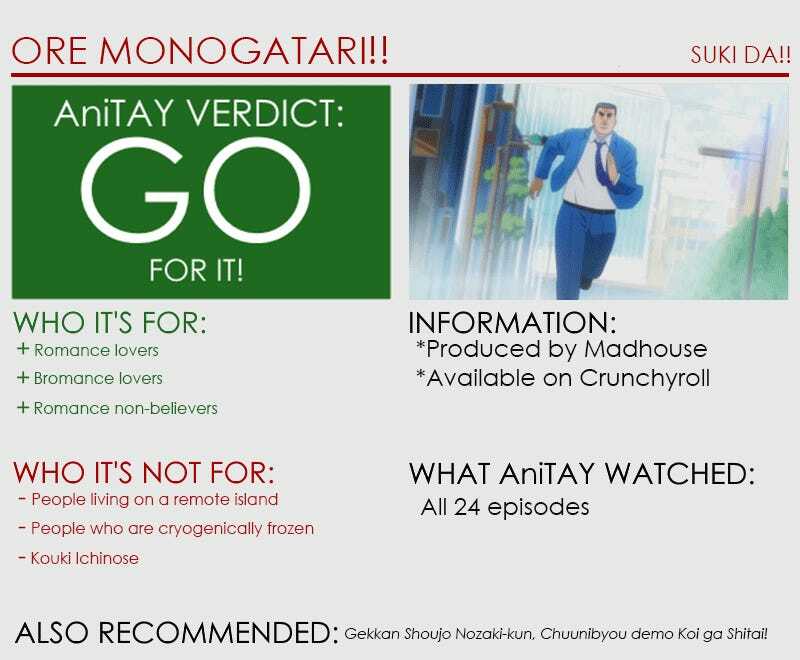 I’m not one to laugh out loud during anime very often, but Ore Monogatari!! did it for me. There is an excellent mix of humor in the show. Takeo provides most of the physical comedy, which stays consistently hilarious to the end. The animation always comes through here, making sure the power and physicality of Takeo’s actions deliver. There’s also an equal amount of humor that come from how the characters handle situations with varying degrees of social finesse. This is one of the few anime that my fiance and I had to sometimes pause just to get the laughs out of our system before we continued with the story. Takeo’s father steals every scene he’s in, from eating dinner like a posh gentleman to asking Yamato if she likes golf, sparkling all the way. 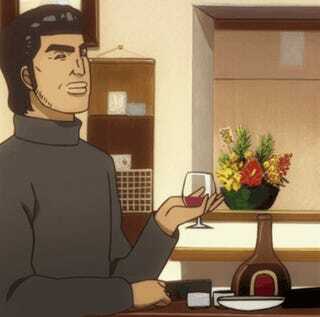 I can only aspire to one day be at that level of living your best life and drinking wine before 10:00 a.m.
On a short, but more serious note, Takeo’s parents are another example of subtle paradigm subversion in the show. Takeo actually takes after his mom in physical strength and tendency to watch out for others. Though Momma Gouda is not a delicate or conventionally attractive lady like Yamato or Ai Sunakawa, she is never portrayed as anything but strong and admirable. In a sweet look at the Gouda’s backstory, Takeo’s father explains how he fell in love with his wife when he saw how she supported her peers, and realized he could navigate life’s ups and downs with such a formidable woman. It’s a wonderful example of a truly equal partnership. Over 24 episodes, the story takes time to flesh out some minor characters aside from the main cast. Alongside such a strong central trio, these supporting characters were more of a mixed bag. Ai Sunakawa, Suna’s older sister who has her own complicated feelings towards Takeo, had a touching story arc with a sense of closure, and she becomes a nice, familiar face in the show. It was also neat to see a subplot about one Takeo’s bros and one of Yamato’s girlfriends develop throughout the show, which gave Takeo and Yamato the chance to cheer another couple on. Other characters, like Saijo (above), who appears for a few episodes as a potential rival for Yamato, were more of a flash in the pan. I ended up feeling like she was more of a plot device than a meaningful character, as amusing as her episodes might have been. Ore Monogatari!! takes place in a world that is genuine, optimistic, and overwhelmingly sweet. Even in the subplots that involve others competing for Takeo or Yamato’s attention, you never get a sense of dread that the couple won’t be alright in the end. I realize that the lack of big drama may turn some people off, or color the show as overly simplistic and positive. The world of the show is a nicer, gentler, more ideal version of life, and I enjoyed getting to spend some time in it every week. Ore Monogatari!! is lighter than what I tend to watch, but it turned out to be a show that meant quite a bit to me. Every week was a chance to laugh, discuss, and get excited for what comes next with the people I care about. It does so many things right beyond being sweet and consistently funny. The show provides excellent examples of positive, healthy relationships for romances and friendships alike. It’s a show about the magic that can happen when you look into a person’s character and surround yourself with others who do the same. Though it focuses on the ups and downs of everyday life over sweeping drama, it was never a dull moment with Takeo, Yamato, and Suna. I’m so glad I got to spend almost six months with these lovely characters. All header, review card, and misc. gifs by Tim C.